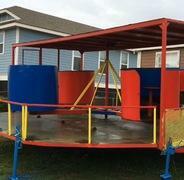 Largest Kiddie Ferris Wheel In Louisiana!! Our Ferris Wheel seats 24 kids(depending size and weight). Attendant and barracades are in place for safe enjoyable fun. Ferris Wheel is awesome for house parties, school function, church events, city events, fairs or just keeping the kids busy. To discribe this ride in one word "Awesome"
This ride is for riders 48 inches and taller. This is the most extreme ride yet. This ride spins riders, flips riders and defy gravity on aother level. Looking for a thrill then this is the ride for you. With hydrolic controls for the most intence ride for Xtreme riders or calmer ride for smaller kids. The Gyro Xtreme is awesome for house parties, school function, church events, city events, fairs or just keeping the kids busy. Our 3 horse carousel will have the little ones riding their hearts away for hours. 3 Hourse Carousel is awesome for house parties, school function, church events, city events, fairs or just keeping the kids busy. Heres our 6 Seat Kiddie Swing. Our Kiddie Swing seats 6 kids. We have a speed control dial for better control of the the speed of the swing to better accomodate smaller kids. Attendant and barracades are in place for safe enjoyable fun. This swing is awesome for house parties, school function, church events, city events, fairs or just keeping the kids busy. Heres our 4 Cup 16 Seater "Krazy Twister". Our Krazy Twister seats 16 kids. This family ride allows aduls to enjoy the ride as well as the kids, so let us bring the kid out in you. Attendant and barracades are mounted in place for safe enjoyable fun. Krazy Twister is awesome for house parties, school function, church events, city events, fairs or just keeping the kids busy. Our KLH Express seats 18 kids. 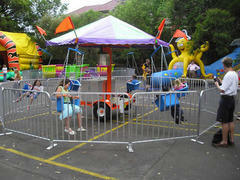 This family ride allows aduls to enjoy the ride as well as the kids, so let us bring the kid out in you. Trained Attendant for safe loading and unloading for safe enjoyable fun. KLH Express is awesome for house parties, school function, church events, city events, fairs or just keeping the kids busy. Our NOLA Pets rides one or two smaller kids per pet. The pets are battery operated for safe and quite indoor use. The pets can be rode indoors, concrete, asphalt and more. NOLA Pet ride allows adults to "watch" their kids enjoying the ride as well as the kids having a blast. Attendant and barracades (if Needed) are mounted in place for safe enjoyable fun. 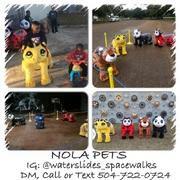 NOLA Pets is awesome for house parties, school function, church events, city events, fairs or just keeping the kids busy. NO EATING OR DRINKING ON THE RIDE.